This letter was written by Lt. Benjamin Franklin (“Frank”) Parker (1838-1912), the son of John Ledger (“Ledyard”) Parker (1820-1864) and Hannah Wolcott Thompson (1820-1915). A family history claims that Lt. Parker’s father — Ledyard Parker — was an habitual alcoholic from an early age who found employment as a mill hand for the Thompson family mill in Conneautville and, against the wishes of her parents, married the mill keeper’s daughter in 1838. They had four children, Mary, Benjamin Franklin “Frank,” David (later adopted by the Neal and Lydia McKay of Meadville) and Rhoda. His public drunkenness, disorderly behavior and lack of responsibility in caring for his family eventually brought his marriage to an end. After their divorce, Hannah supported herself and children as a domestic worker and, later in her life, moved to Wisconsin, where she married J. C. La Tour — an oral surgeon, dying in Madison in 1915. Ledyard married a second time and had a second family but this marriage also ended in divorce for the same reasons. 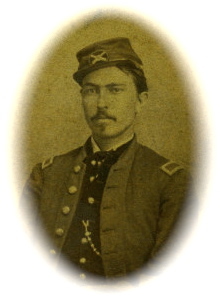 In August 1864, at the age of 44, Ledyard enlisted as a private in Co. E, 2nd Pennsylvania Cavalry. He was injured in the famous Siege of Petersburg (Virginia) and died of his wounds on 16 December 1864 in a hospital at City Point. Lt. Frank Parker was born in Meadville, Pa., July 27, 1839. He “received an academic education at the Academy of Meadville, and in 1853 came to Wisconsin, and served a regular apprenticeship with his uncle at Waukesha, as a carpenter. On the breaking out of the Civil War, he was among the first to enlist. Being in the woods, distant from mails, he did not get the news in time to get into the 1st regiment, but reached Milwaukee and enlisted, April 21, 1861, in Co. K. 2d Wis. Vols. After participating in the battle of Bull Run, Co. K was transferred and reorganized into Co. A, 1st Wisconsin Heavy Artillery. He was with his regiment throughout its service, until the Summer of 1863, when he was detailed with two other sergeants to recruit three batteries for the 1st Battalion Heavy Artillery. He returned to Mauston, and recruited Battery C, was commissioned second lieutenant, and returned to the front. He was promoted to senior first lieutenant, and served until the close of the war, without meeting with any mishap or getting on the sick list. He was mustered out, November, 1865. I left Milwaukee last Thursday at 4 o’clock P. M. Mary and Clara went in town with me to see me off. We had a very pleasant time and everything passed very agreeably indeed. Although it was much harder leaving this time than ever before, I must say that I have had a much pleasanter time than I could expect, and such a good visit with you. The boys of my Battery expressed much joy at seeing me return in safety. The weather here is warm and balmy as our Wisconsin May days. Peach trees are in full bloom and the leaves of trees are beginning to put forth their beautiful verdure, and everything is smiling and beautiful as heart could wish. Tell the doctor that I went in the city horseback and lost the key and hook off from the watch chain. I cannot send him the money as yet for reasons of my own. Please give him my best regards. I shall expect to hear from you often as I know you will write to your boy as you ever have. I hope your health will continue and improve so that you will be in better spirits even though when I was with you last. As regards war matters, everything continues quiet in this region. Quite a body of troops have gone through here to Knoxville & Bull’s Gap to stop Lee from trying to escape in this direction. Our Sr. 1st Lieut. has resigned as I expected he would, so I am second in command, and there is good prospect of my being Captain before many months transpires. Give my regards to Penniman’s folks if you see them and tell Lucille I arrived safely. Don’t tell her I said so.